In 1926, Eric von Willebrand described a bleeding diathesis in a series of families from Aland Islands in Finland, that although resembling hemophilia bleedings the patients have also shown platelet function abnormalities. Referred to this condition as ''pseudohemophilia,'' he clearly identified a different pattern of autosomal inheritance with varying degree of the penetrance. The pathophysiology of this disorder has been clarified during the past 40 years when it was noted the difference in bleeding tendencies between factor VIII deficiency hemophilia and von Willebrand disease (VWD) which is caused by deficiency of another clotting protein, namely, the ''von Willebrand Factor or VWF.'' In 1985, VWF cDNA was cloned, allowing major advances in the molecular genetics of VWD, and, subsequently, its structure was deduced from the cDNA and confirmed by direct amino acid sequence analysis. Von Willebrand disease is a common autosomally inherited bleeding disorder with variable clinical presentation. Von Willebrand disease is due to quantitative or qualitative abnormalities of VWF and its gene is encoded on chromosome 12.
von Willebrand factor is a large, multimeric glycopro-tein (10-20 x 106 kDa) circulating in blood plasma, platelet a-granules, and subendothelial connective tissue, and secreted by the vascular endothelial cells and bone marrow megakaryocytes.1-2-1 von Willebrand factor has two essential hemostatic functions: mediating platelet adhesion to subendothelial connective tissue and carrying FVIII in blood circulation, essential for normal FVIII survival. von Willebrand factor gene is located at the short arm of the human chromosome 12 (12p13.2), contains 52 exons, and spans about 180 kb. The structure of VWF gene, pseudogene, the protein, and its specific functional domains are summarized in Fig. 1. Exon 28 is the largest exon with 1379 bases, encoding for A1 and A2 domains. A VWF pseudogene has been localized on chromosome 22q11-13, spanning 21-29 kb and corresponds to exons 23-34 of VWF gene. 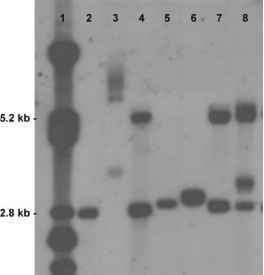 The VWF cDNA encodes a primary translocation product of 2813 amino acid residues. Von Willebrand factor precursor contains 22 amino acids signal peptide, a large propeptide of 741 amino acids and a mature subunit of 2050 amino acids. Amino acid residues of VWF are numbered from the signal peptide, which would be from 1 to 2813. The VWF subunit is extensively glycosylated with 12 N-linked and 10 O-linked oligosaccharides. The N-linked oligosaccharides of VWF have the unusual property of having ABO blood group determinants and this has implication in the level of VWF concentration. Following translation of a ~ 9-kb mRNA, removal of the signal peptide, and initial glycosylation, the monomeric subunits of VWF with a molecular weight of approximately 250 kDa form dimers in the endoplasmic reticulum. In the endothelial cells, after further posttransitional modification in the Golgi apparatus, large VWF multimers are either constitutively secreted in the circulation or stored in Weible-Palade bodies which release their stored VWF molecules after stimulation by a variety of stimuli, including vasopressin analog (DDAVP) treatment. Various binding functions of VWF are localized to different domains of this molecules including binding to platelet glycoprotein Ib (GP1b), ristocetin, botrocetin, heparin, sulfatides, and minor binding sites for collagen types I and III.